PHILADELPHIA–Integral Molecular, the industry leader in membrane protein technologies, was awarded a Small Business Innovation Research (SBIR) grant from the NIH to initiate a target discovery program for Alzheimer’s disease. 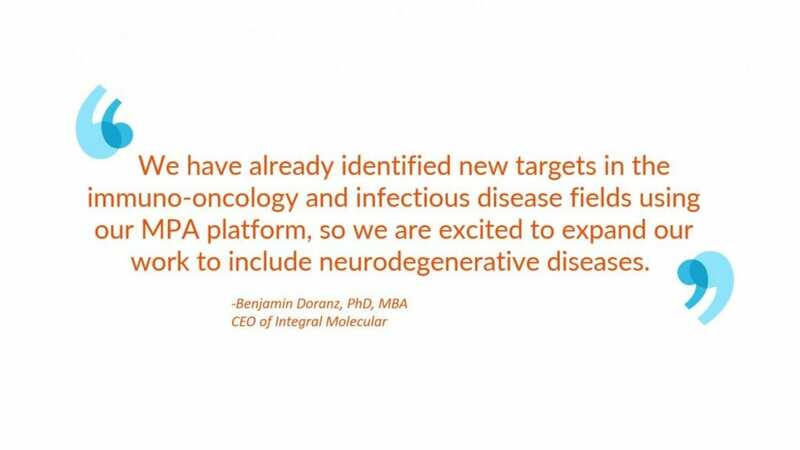 Under the grant, Integral Molecular will use its highly successful Membrane Proteome Array (MPA) platform to discover novel neuroimmune targets for treating Alzheimer’s and other neurodegenerative diseases. Neurodegenerative diseases are a leading cause of death and disability for 6.5 million older Americans. A major roadblock in the development of new treatments has been the lack of druggable targets. Recent research suggests that dysregulation of the immune system can cause or exacerbate many neurodegenerative diseases. The identification of new proteins that can regulate the neuroimmune system could enable the discovery of an entirely new generation of therapeutics with the potential to treat, delay, or even prevent Alzheimer’s disease. Integral Molecular’s MPA technology is composed of 5,300 human membrane proteins expressed in their functional form on the surface of live human cells, allowing signaling and binding assays to detect functional interactions. Integral Molecular has already used the MPA to identify novel targets and protein interactions in various therapeutic areas, as well as to obtain off-target binding profiles to derisk drug development. Integral Molecular is the industry leader in membrane protein antibody discovery, with a pipeline of therapeutic antibodies against GPCRs, ion channels, transporters, and immuno-oncology targets. Built on the company’s extensive experience optimizing membrane proteins, this platform enables the isolation, characterization, and engineering of MAbs against otherwise intractable targets. Integral Molecular discovers antibodies for partners in parallel with independent work developing antibodies for licensing. The company currently has therapeutic programs focused on cancer, pain, immunity, and metabolic disorders.